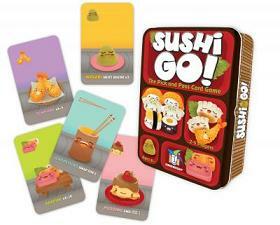 In the super-fast sushi card game Sushi Go!, you are eating at a sushi restaurant and trying to grab the best combination of sushi dishes as they whiz by. Score points for collecting the most sushi rolls or making a full set of sashimi. Dip your favorite nigiri in wasabi to triple its value! And once you`ve eaten it all, finish your meal with all the pudding you`ve got! But be careful which sushi you allow your friends to take; it might be just what they need to beat you!